A review of a fine dining Long Branch, New Jersey restaurant serving up New American fare. 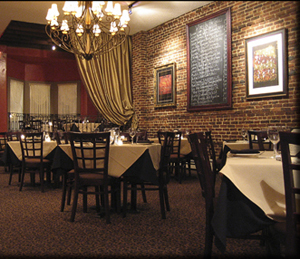 This Long Branch American bistro is set in a softly lit dining room that boasts turn of the century brick work. The atmosphere is very warm with colors of rust and elegant drapery along with wrought iron chandelier's and one wall natural brick give it a Castilian castle feel. While waiting for your table, pull a chair up to the hammered- copper bar to enjoy a glass of wine from their excellent selection of wines. They serve up well prepared, American eclectic food dishes, with fresh ingredients and very attractive, creative presentations. You can expect a fine dining experience at Cask 591, from the food to the friendly and attentive service. Their signature dishes are beef and chicken entrees cooked over wood from wine casks treated with wine, bourbon and other fine spirits. For those who prefer something other than red meat and fowl, they have a good selection of seafood fare, including a seared scallop appetizer in a wild mushroom tea and white truffle oil. Recommended dinner entrees are; Vegetarian Steak whole grain ‘steak’ with sweet potato puree, braised greens & burgundy-mushroom fricassee; Maryland Jumbo Lump Crab Cakes with gold potatoes, citrus grain mustard sauce and seasonal vegetables; Hudson Valley Duck With crispy confit leg, vanilla sweet potato puree, roasted vegetables & cranberry duck jus; and Grass Fed NY Strip with Pinot Noir butter and served with mashed potatoes & charred tomato-onion ‘confit’. Save room for dessert, especially the Warm Pineapple Upside-Down Cake Coconut rum anglaise and rum raisin gelato; or the Warm Valrhona Chocolate Decadence Strawberry sauce and vanilla bean gelato. With an impressive wine list, either by the bottle or the glass, this restaurant is a good choice for diners looking for fine dining, either for a romantic dinner, or a special evening out with friends. Interested in a quick bite and at a reasonable price, they also have a creative luncheon and lounge menu with a good selection of appetizers, salads and sandwiches. They have live entertainment on Friday and Saturday evenings.